The quick charging stations will be located at either end of the 36 Monk line so the buses can be charged between runs. MONTREAL - The first of three STM electric buses are rolling in Montreal. The test batch is part of the city's plan to have a fully electric fleet by 2025. Over the next few weeks, one bus at a time will be put into circulation along the 36 Monk line, going from Angrignon Metro station to Square Victoria Metro station. Rapid charging stations have been set up at both locations, so that batteries can be charged during the day between routes. The buses are also going to be fully charged at regular charging stations overnight. Each bus can run from 15 to 25 kilometres on a single charge. The Monk line was chosen in part for its length, around 11 kilometres. 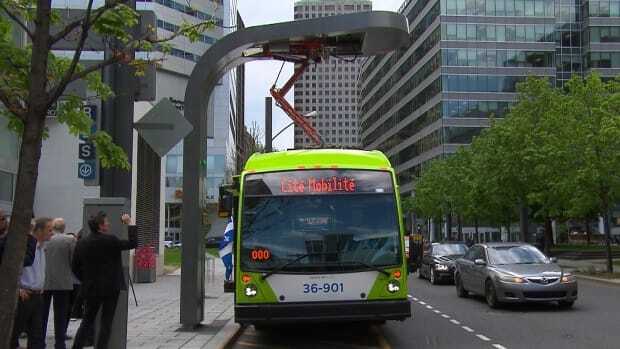 The STM has been testing the electric buses to make sure they can stand up to Montreal's harsh winters, and now they are ready to take on passengers. The motors were designed in Boucherville, and the buses themselves were built in Saint-Eustache. No timeline has been set for when the STM will be ready to roll out the whole fleet, but Montreal Mayor Denis Coderre, who was on hand at Tuesday's unveiling, told reporters he has confidence in the $11.9-million program. "We start with three. Trust me, there will be more." said Coderre.